Got this photo from a friend. Was really amazed by the shot. I mean, in that kind of occasion, you’d be happy to have a glimpse of HH Sakya Trizin while managing to stand properly somewhere. 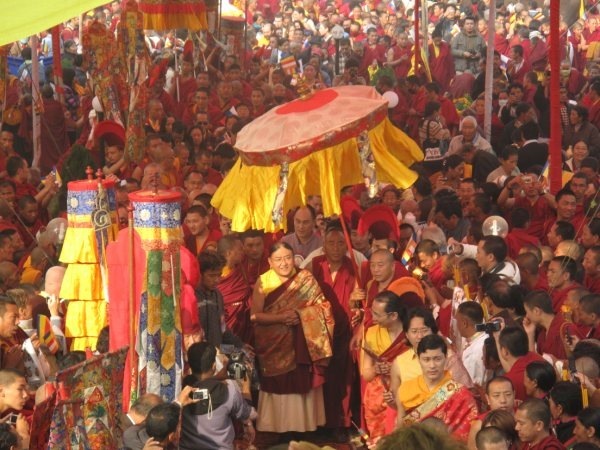 It was taken at the 2010 Sakya Monlam in Lumbini, by courtesy of Shan Drolma. While we are waiting for the bus to departure in the bus station, finally I see the famous Annapurna Himalayas! The experience is almost divine – there’s the typical green mountains, and behind them and almost double the altitude of the the 1st layer is the 7000m+ white peaks of Himalaya. In Tibet, usually you’d be at 4000m+ to view the peaks so the feeling wouldn’t be as drastic. I told Namgyal that I’ll be back for Mustang. Just imagine taking a flight from Pokhara going through the Hymalayas to reach Mustang! Even the flight itself will be worth the journey. There’s no direct bus to Lumbini so we took a so-called tourist bus to Bhairawa (Rs. 330 or $5 USD for 7 hours) and then local bus (Rs 15, 1.5 hr) to Lumbini. Most of the tourists in Pokhara are heading to Chitwan Park so locals outnumber real tourists on the bus to Bhairawa, a very big city near the border to India. Lumbini is the birthplace of Siddhartha. In Siddhartha days this place should be a beautiful garden and later his followers added monasteries and other monuments. In later days, the place got abandoned for unknown reason and the later Mughal invaders arrived in the end of the 14th century destroyed all the remaining monuments. Therefore the site is only excavated not long ago to confirm that Siddhartha was indeed born here in ca. 563BC and it is still under development. In the excavation site, there’s a rock marking the exact place where Siddhartha was born and one remaining stone sculpture depicting the scene though ruined by the Mughals. Many big trees around the site though the Japanese cut off some already. There’s a small monastery built by Chogye Rinpoche in the 80’s on the way to the site with the nicest garden in the whole area. The construction was possible under the help of the Mustang King I ran into the other day. He helped to get special permission from Nepal King to build the monastery in this sacred place. Further away to the site is a development area consisting of temples from around the world: Thailand, China, India, Myanmar, Vietnam and some under construction e.g., Korea’s. The development zone also has some meditation centers with some westerners around. Outside of the development zone, there’s just a few houses partially converted to guesthouses, one upscale hotel and a handful of restaurants. I am not sure whether this can be counted as a village or not. Apparently they must do wonders to build tents to provide various services in the high season. Since it’s low season now – already very warm in Lumbini, the price of a double room with bathroom falls to Rs. 250 (i.e. 125 TWD, or $4 USD). The pedicab ride around the new development zone also falls from Rs700 to Rs 250 for us. The timing was perfect for the ride as the temperature cooled down significantly at 5pm.